I was planning to make my first product review about some of the food samples I’ve received from Foodbuzz.com, but I thought it’d be nice to switch gears for a bit and talk about one of the tools that helps me out quite a bit in the kitchen: the Reynolds Handi-Vac. Those of you who frequently buy in bulk are probably very familiar with the wonders of vacuum sealers. They allow you to store and freeze things like produce, meat, leftovers, etc., for longer than you’d be able to keep them in the fridge or at the mercy of freezer burn. You can also store dry goods and not have them go stale as quickly. The space you save in your cupboards and freezer is an added bonus as well. But what happens when you don’t have a large family and don’t need to buy food in huge quantities, yet still want to save something for later? I used to go through this a lot with certain meats I’d buy, since I only cook for one or two and don’t need to cook an entire London Broil all at once. And what if you’re like me and have a kitchen the size of a thumbtack? One of the conventional vacuum sealers could solve the freeze-and-save-for-later dilemma, but where could it possibly be stored? You can’t really vacuum seal a vacuum sealer to shrink it for easy storage (though that’d be kind of interesting to see). And then there’s the price. Though I could see the need for this type of gadget, I’m not always in the position to spend $40-50 on what I’d consider a luxury. Heck, after I pay my rent I’m usually left with that amount of money and have to make it stretch for 2 weeks, so fun kitchen toys are not always on my shopping list. Fortunately, the folks at Reynolds came up with what I think is a wonderful solution. They created a compact, hand-held mini-vacuum sealing system that works beautifully. It comes with both gallon and quart-sized bags that are specifically designed for the Handi-Vac and starts at a mere $9.99 at most grocery stores and places like Target. Ridiculously simple to use, all you do is put the food in the bag, seal the zippered part, place the vacuum sealer on the suction point of the bag and wait a few seconds for your items to be vacuumed sealed. It’s a little noisy, but other than that it’s a perfect little gadget. Measuring only about 7”, you’ll find it’s also pretty easy to store. Extra bags are available for around $3 in both sizes as well. Things at work have been really stressful for me these days, so as much as I want to delve into certain recipes that I have in mind, lately I've just wanted to make something quick and easy that requires almost no thought or effort. Not that most of my dishes aren't really easy to prepare (that's part of their charm); I've just taken it to extremes the past couple weeks. Everything is still rather tasty, I just feel like certain things are not PGEW-worthy and don't post them. Last night when I made this I realized how silly I was being. My goal is to show you how even the most mundane-sounding combination of ingredients can turn into a satisfying meal, and that's why I'm bringing this new quesadilla recipe to you fine folks. As I do with grilled cheese sandwiches, I like to get all sorts of creative with my quesadillas. Sure, the more traditional versions are delicious, but food is supposed to be fun and part of that fun is to mix and match. Ladies, we do this with fashion separates all the time, and I'm sure you can agree that some of your cutest outfits have come from stepping outside the box and throwing together something new. That's pretty much what I did with this quesadilla. I peered into my fridge yesterday, staring longingly at the other fun ingredients I had that would make some incredibly fancy dinners, but my eyes lingered on the remaining mushrooms I had scored last week at the farmer's market. Figured I should use 'em before they went bad. Thought they'd go nicely with the remaining Gouda I had been meaning to use in a new grilled cheese recipe (which will happen at some point, I promise) and had considered making a different sandwich, but decided a warm flour tortilla was more up my alley at the time. But just mushrooms & cheese didn't offer me the right amount of aesthetic appeal - I like pretty food! - nor did I feel like I had anything rich in vitamins to help offset the guilt of the cheese... what to do, what to do? Spinach! Who doesn't love the spinach & mushroom combo on a pizza? Mushrooms, and spinach, and Gouda, oh my! I was already excited at my new quesadilla prospect. Before I bust out this uber-easy recipe, I want to point out once again the importance of being creative when you don't have much to work with, whether it be ingredient-wise or time-wise. I could have chosen to have a plain Gouda quesadilla and call it a day, which would have been fine by me. However, it wouldn't have been very exciting. These days, we're all looking for ways to enjoy life to its fullest within very limited means, and not feel deprived of the things we used to enjoy just a few short years ago (like eating out, etc. ), and a big way that I do that is by matching - if not surpassing - what the average restaurant could serve me. Somewhere out there is a restaurant that might have this same dish on the menu (though I haven't found it yet), but I'm certain they would charge me about 2-3x as much as what I spent on making it myself. Not to knock restaurants, because I love them and miss eating out. But chefs get creative and bring you amazing meals, and guess what? They're humans like us and didn't always know how to do that. I didn't always know I could be as inventive as I've gotten over the past year and a half, but here I am doing it. And so can you. Even if it is with something as simple as a quesadilla. Rinse mushrooms and pat dry. Slice into thick pieces (about 1/4") so they are still nice & chunky after being sauteed. In a small pan melt the 2 T of butter over medium heat. Add the garlic and heat until a light golden brown. Add the mushrooms, garlic salt, and lemon pepper, and sautee lightly until the mushrooms become tender. Do not overcook! In a large skillet, heat some of the olive oil over medium heat, making sure the entire skillet is coated. Heat each tortilla by heating on one side until bubbles form, piercing the steam bubbles carefully, then flipping onto the other side until both sides are a very light golden brown. Add about 1/2 the cheese (1/3 c) and spread evenly on the tortilla. Cover and let heat for about 1-2 minute to allow the cheese to melt quickly. Add the spinach, followed by 1/2 the sauteed mushrooms. Top with the second tortilla and flip onto the other side to make sure both sides are evenly heated. Serve with Pico de Gallo or with some of the extra juices from the sauteed mushrooms, and enjoy! 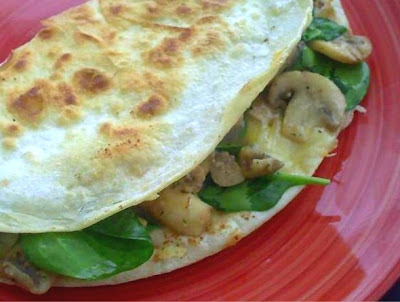 Note: I made mine with a single tortilla and flipped it closed omelette-style as you can see by the picture, which is a great way to cut about 140 calories. Saves you a few cents per serving, too. Either way you make it, it's still pretty tasty! As much as I love going to my local farmer’s market, it’s not always feasible for me to do so for one reason or another (lately because of choir commitments). In order to keep myself somewhat healthy, I make sure to get as many frozen veggies and fruits as I can afford. Could I do this at any other grocery store? Of course! I just wouldn’t have choices like the Organic Foursome (carrots, corn, green beans, and peas), Brittany Blend (string beans, wax beans, carrots), Potato Medley (an awesome mix of potato wedges, peppers, and other veggies, all lightly seasoned), or my all-time favorite: Greens With Envy (spinach, edamame, broccoli, snap peas, and a whole bunch of other green veggies; sadly, I think it’s only seasonal). The fruits are just as fun, with extremely high quality whole berries, mango, pineapple (which is to die for, as each piece is coated with a bit of extra juice), the Very Cherry Blend (whole black Bing cherries, strawberries, blueberries, and raspberries), and my latest favorite: Mangolicious (mango, blueberries, and raspberries. WOO!). There’s a lot more to choose from but these are just some of my usual purchases, since I find I can make just about anything with these basics. Everything is reasonably priced from about $2.29 to $4.99, and most of the produce is organic. When was the last time you were able to buy langostino without paying an arm and a leg for it? Or how about a reasonable amount of frozen shrimp for well under $10/bag? From Cioppino mix to stuffed salmon filets, buffalo burgers to lamb, there's a little bit of something for everyone who loves to eat meat. Personally, I like to snag the medium cooked shrimp (about 50/bag) for the beautifully low price of $5.99. I've mentioned this deal in previous posts and have compared prices at other grocery stores, including outlets, and TJ's still has the best deal. The lowest price I've seen for something comparable is $8.99 and sadly, most of the bag was full of freezer burn, not shrimp. Another staple I buy from the TJ's frozen meat section is the large bag of boneless, skinless chicken thighs or breasts for $6.99 and $7.99 respectively. Thaw ‘em in the fridge while you’re at work and you’re ready to start cooking by dinnertime. Though I’d prefer to buy the whole, fresh chicken, these are very convenient and rather tasty as they use natural juices when freezing. Ahh, this has to be everyone’s favorite part of Trader Joe’s. They offer amazing pre-made meals that make even the worst cook look like a pro. Entrees like Mandarin Orange Chicken, Shrimp Scampi with Pasta, Chicken Serenada, or sides like Gnocchi a la Gorgonzola are all delicious, heat in under thirty minutes, and cost under $8 for about 2 modest sized servings. In a pinch these are great to have around, though you can get more bang for your buck if you buy your ingredients separately (then you can make other meals out of whatever is leftover). Still, on a lazy night after a hard day’s work, these are fantastic meals that are made out of real ingredients with few, if any, preservatives. Part of my aversion to a lot of pre-packaged meals is the amount of crazy, difficult-to-pronounce chemicals that are thrown in “for freshness”. I’m fairly certain the human body wasn’t meant to consume that sort of thing on a regular basis, so I feel better when I read the ingredient list and most everything is derived from real food. Now that I’ve had my say about the evils of processed foods, I’ll get back to the good stuff. The frozen appetizers at TJ’s are phenomenal and, once again, make you look like the greatest chef ever. Seriously, how often does one make Escargots en Brioche for about $6? Their Bruschetta appetizer is lovely, and they have this fabulous Black Truffle Flatbread that’s to die for. Mini-pizzas, sweet potato fries, chicken wings… you name it, they have it! Last, but certainly not least, is the dessert section. From creamy New York Cheesecake to Chocolate Lava cakes, it's easy to get some fabulous, high-quality desserts for relatively low prices. The Tiramisu Cake is incredible (it's just a pain to wait for it to thaw! ), but I highly recommend the Apple Blossoms. At just $1.99 for two, these little apple-filled pastries are delicious baked or just warmed in the microwave. You can also get some great natural fruit popsicles, tofu-based desserts, and ready-to-bake pastries. The only thing I find slightly lacking is their ice cream selection, but with everything else you're able to find there, it's not all that necessary! Okay, okay, so this dessert isn't served in a shot glass; I have violated my sacred law of tiny sweets. However, it's almost entirely good for you and not at all rich, so I figured having a martini glass full of it was in order. Despite the cheese, I've been a good girl and have been chipping away at the winter pounds with some nice workouts, but a girl still needs her dessert, right? Dessert doesn't always have to be creamy and rich though, so I figured I'd go the more natural dessert route and use whole fruits instead. 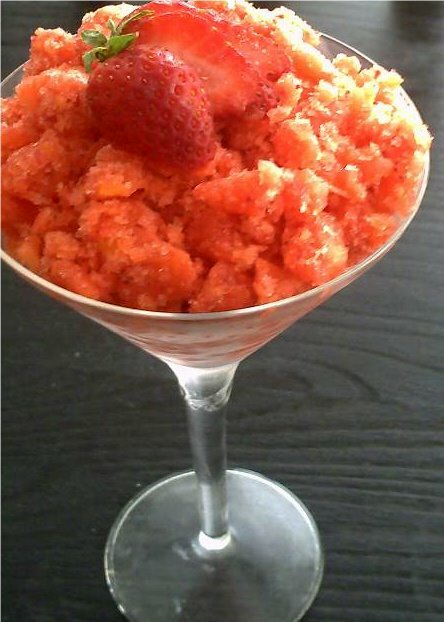 Behold the Strawberry-Mango Granita. Granita recipes are a great way to use up a lot of fruit that you may have lying around. It's not uncommon to buy a bit more fruit than will actually be eaten in a timely manner and then be left with the possibility of it going bad. Sure, you can freeze the fruit for smoothies and things like that, but even that can be forgotten in the freezer and you're just stuck with freezer-burned fruit. This is just another way to use sweet berries and the tropical deliciousness that is the mango. Whether you have fresh fruit or fresh frozen, this will still be wonderful. The fact that it's a practically guilt free dessert is a huge bonus. It's also really easy to make, as long as you can exercise some patience. It does take time to acheive the flaky crystals that make a good granita, but the results are well worth the wait. Don't feel bound to eating this all by itself. Some of the best granita desserts I've had have been served with contrasting fruit coulis (which I was tempted to do with this one but got pressed for time) or with yummy whipped cream. I think this is perfect all on it's own, though; the sweet tartness of the berries coupled with the exotic flavor of the mango makes for a refreshing departure from the richness of winter desserts and makes you think of and taste the summer that's almost around the corner. Combine the water & sugar in a bowl and stir until the sugar is completely dissolved. Puree the strawberries and mango chunks in a blender until almost smooth (this way you still have a bit of fruit texture instead of straight ice at the end). Add the syrup and blend together until completely combined. Pour the mixture into a 13" x 9" x 2" metal baking pan and place in the freezer for about 30 minutes. Remove from freezer and use a fork to scrape the icy edges inward toward the center of the pan. Place back in the freezer and repeat the process every half hour or so until completely frozen. You should be left with flaky, icy granules. Serve in wine or martini glasses and garnish with extra berries or mango pieces. If making ahead of time, place the finished granita into an airtight container and keep in the freezer until ready to serve. Enjoy! The only bad thing about the new season of spring here in the Sacramento area is that it brings a friend with it: allergy season. All the familiar symptoms are starting to rear their ugly heads right now. Still, the weather has been getting lovelier and lovelier, and most of the trees are approaching full bloom, so it’s too beautiful out there to complain too much about sneezing all the time. All this great, warm weather has been making me want to go outside and play like a 4-year-old, or have a picnic, or just do anything outside after so many dark, dreary months. It also makes me crave salads more than I already do, and since I haven’t had a good tuna salad in awhile, I thought this would be perfect to enjoy for one of my first lunches outdoors this year. I love tuna salad as a rule but find most deli or restaurant prepared versions too mayonnaise-y (is that a word? It is today!). When I was a kid, my mom’s tuna salad had a nice balance of mayo and tuna, along with all sorts of crispy veggies, so when I got older and saw that most places made you wonder if they shouldn’t call their tuna salad a mayo salad with a side of tuna, it was a huge disappointment. I’ve made some awesome variations over the years (one with thick chunks of ahi tuna and this incredible dressing I’ll need to post soon), but there’s one they sell at the Sac Natural Foods Co-op that did make me skip around like a 4-year-old when I first tried it, it was that good. Their Mediterranean Tuna is not only delicious, but much healthier than the traditional mayo-based versions. Sadly for me, it’s like $8/lb, so I don’t get to enjoy it as often as I’d like. That is, until I decided to start making my own modified version of it at home. For about the same price as one pound of the prepared salad from the Co-op, I am able to get almost all of the ingredients and make this several times over. As I always say, if you purchase whole ingredients versus pre-made items, you can save a lot more because of how much further you can stretch the ingredients. Pre-made is great for convenience, but when you're trying to save money, it's not always the best option. The Co-op’s version has quite a bit of kalamata olives in it (which adds to the weight factor when purchasing it at their deli), but because they’re a bit too pricey I omit those from my version. If you happen to come across a good deal on some kalamatas, by all means add them in! They just further enhance the flavor. 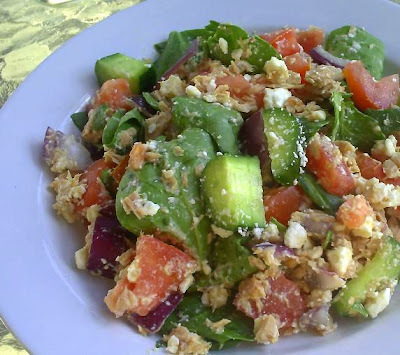 I also use low-fat feta cheese to up the guilt-free factor, but regular creamy feta is also amazing in this dish. Keep in mind that the tuna shares the spotlight with the rest of the veggies in this salad, though it’s perfectly okay to add more if you like a higher tuna to veggie ratio. You can serve this as a side or an entrée, and its beautiful colors make this a lovely salad to bring to a party or potluck. And it’s one of those perfect make-at-work lunches since it takes almost no time to make. Here’s the incredibly simple recipe! PS – I took this picture outside yesterday, hence the awesome lighting! Chop all veggies into 1” chunks and place into a bowl. Drain the tuna of its water and add it to the veggies, followed by the baby spinach. Crumble the feta onto the rest of the ingredients and toss lightly until everything is completely coated with the feta. Check for flavor; you probably won’t need much salt since the feta has plenty of its own, but add salt & pepper if needed. Serve with a side of pita bread or on its own, and enjoy! Sometimes the simplest meals are the ones I love the most. Though it's fun to play around with all sorts of food combos, there really is nothing like an easy, no-frills meal that takes almost no time to make. If it's healthy, that's even better. Luckily, that was my dinner situation last night. I had these gorgeous salmon filets that kept flirting with me every time I opened the freezer and thought they’d go nicely with some French cut green beans. Some crispy, pan-fried shallots seemed like a nice finishing touch, perhaps with the tiniest drizzle of lemon butter. I thought about dinner all day at work and was happy to get right to cooking once I got home & fed the kids (er, cats). There’s a lot of room to play with since the ingredients are so simple and complementary. I had some sockeye salmon filets that were just a gorgeous pinkish red and they turned out amazing (an absolute steal at just $6.97), but most varieties of fresh or frozen salmon are perfect for this. I grilled my salmon but I imagine broiling would be just as delicious. You can also use regular green beans as opposed to the French cut, just be sure they’re fresh as canned beans would not be the same in terms of flavor and nutrition. Or price! A can of green beans at a regular grocery store can run about $1.45 or so, and most of those 14-15 oz. come from the water in which the beans are packed. Fresh green beans cost about $2-3/lb, and because they’re so light you can easily grab several handfuls before you even reach the pound mark. Even a half-pound of the fresh beans will yield more than a can of the other stuff and taste much better. Topping everything off with some shallots that are browned just beyond caramelization to become crispy (but not burned) adds a nice crunch and enhances the flavor. If you don’t have access to shallots, using half a red onion will also work just fine. 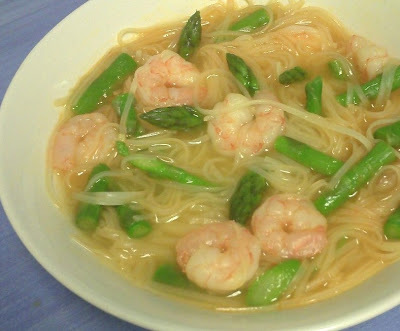 Enjoy the simplicity of this meal with a nice glass of Chardonnay as I did, and relish in the delight of a meal that is tasty, low-cal & packed with nutrition, and that costs less than $4/serving. Talk about eating well! Cut the shallot into thin pieces about ¼” in length. Heat a tablespoon of olive oil in a skillet, add the shallots, and cook over medium heat until they turn a crispy dark brown, stirring occasionally and making sure they don’t burn. This takes about 7-8 minutes. In the meantime, rinse green beans and snip off the ends if desired. Prepare the salmon for grilling by sprinkling a couple pinches of salt and lemon pepper on each side of the filets. Heat the grill and cook the salmon for about 4 minutes on each side or until cooked all the way through. While the salmon is grilling, steam the green beans until tender (if you don’t have a steamer, blanche the beans in boiling salted water for about 45 seconds, then plunge into cold water to avoid overcooking). If making the lemon butter, melt the butter in a small pan, add garlic, lemon juice, and salt, and mix together well. When all the ingredients are cooked, assemble on a plate with the green beans topping the salmon. Top with a sprinkle or two of the pan-fried shallots, drizzle with a bit of the lemon butter if desired, and enjoy! I noticed that I've been neglecting my vegetarian friends lately (and that I've reached a weight loss plateau already; why is this so hard after 30? ), so I wanted to work on something different, something sans meat. Or even cheese. Don't get me wrong, I love my meat & seafood; it just gets dull after awhile. And okay, I confess I was having a "nut & twig" day - I wanted something earthy & nutty tasting as opposed to my recent flavor-centric meat dishes. The Co-op has their bulk red quinoa on sale this week (woo hoo! ), and since I'd yet to cook with it but had a fun idea for a salad featuring the "mother grain", I thought I'd grab about 1/2 pound of it. I knew I still had some gorgeous broccoli at home and thought it would go well with the red quinoa and some tofu. And wanting to depart from my usual vinaigrette dressings, I decided to experiment with an almond butter based dressing. Something in my head told me this would all go beautifully together both aesthetically and tastewise, and I couldn't wait to get home to make it (though I got sidetracked by a new stray kitten that seems to be hanging out on my front doorstep. 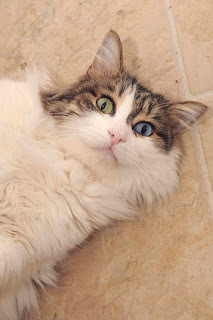 Please remind me that my apartment is too tiny for yet another cat!). I'm glad I listened to myself because I was right. And not only is it super tasty, this dish is also ridiculously simple to make - the longest you'll spend working with any one ingredient is the 1/2 hour or so it takes to cook the quinoa (after rinsing it). It works well as both an entree or a side, by itself or over some fresh greens, and packs a nutritional punch no matter how you serve it. And at less than $5 for the entire bowl (this easily serves 3), you are reminding the food industry that yes, healthy CAN be affordable! Anyhow, you can easily make this with regular quinoa if you don't have access to the red; however, if you can find the red you should go for it because the end result is just beautiful with the green of the broccoli set against a bed of deep reddish brown quinoa (and now that I think of it, next time I will use some finely chopped red onion instead of the green to bring out more of the color & flavor of the individual ingredients). Flavorwise I noticed the red version has a slightly nuttier quality to it than the regular version, so either way it's a fun departure from the norm. As for the almond butter dressing, I wouldn't suggest substituting with peanut butter as it completely changes the flavor of this dish. It's a bit too overwhelming for the subtle flavors of the other ingredients; the creamy sweetness of the almond butter seemed more appropriate. And if you are lucky enough to have a store that offers different varieties, try to get the raw, creamy style as it's the easiest to use when making dressings. Can't find almond butter anywhere? Make your own! Pulse a couple cups of raw almonds in a food processor until smooth, and voila! Usually they have enough of their own natural oils to make this just as perfect as the jarred kind. Make the dressing by combining the first 5 ingredients in a small bowl and whisking together until smooth. Add the water a few drops at a time to help thin the dressing a bit. Cover and set aside. Heat a couple tablespoons of oil in a medium skillet and add the garlic. When lightly browned, add the tofu and a dash of salt. Stir-fry for about 3 minutes or until tofu begins to brown just a bit. Add the broccoli and cook quickly until the broccoli becomes bright and tender. Combine the quinoa, tofu, and broccoli in a large bowl and mix together gently. Add a couple tablespoons of dressing and mix until completely combined. Drizzle with some extra dressing on each serving, garnish with sliced almonds and scallions, and enjoy! 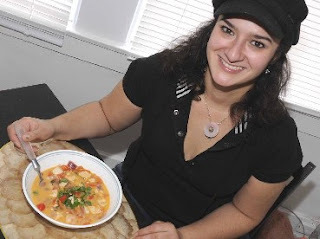 Newsworthy: "Rachael Ray of Blogging" - PGEW featured in the Sac News & Review this week! A couple weeks ago the Sacramento News & Review (a free local paper equivalent to the Guardian in San Francisco) had a cover story called "Will Work for Minimum Wage". Considering I've become somewhat of a consultant in similar matters, I decided to keep myself current and read the article by Nick Miller. He described pretty much what I go through most of the time: trying to budget here, needing to spend on something unexpected there. I felt badly for him because he didn't seem to have the best restraint when it came to food (I know the feeling!). I shot him an email telling him to check out my blog for the next time he decided to go the minimum wage route, and he actually told me he'd thought about including my blog in his article; instead, he did a separate feature. In the SN&R's 15 Minutes feature, local folks from the Sacramento region are featured for doing cool things like having an awesome coffee house, opening up a new barbershop, even food blogging. :) Nick asked me some questions, I answered them, they sent Anne Stokes to my apartment for a mini photoshoot (Stuart made sure he was part of it) and just a few weeks later, I'm in print (and on the cover, no less), being hailed as the "Rachael Ray of blogging" with delicious food pics to boot. Not too shabby. Sac locals (and Davisites, etc. ), you know the SN&R is free, so pick one up this week! Everyone else can read the story here. Thanks again for everyone's support! It's amazing how one ingredient can inspire a variety of ideas. I came up with the following recipe simply because of a free sample I got at the Sac Foods Co-op a few weeks ago. Along with their veggie chips and some other snacks, they were offering free samples of these Thai-spiced cashews that were simply to die for. They were well-seasoned with plenty of salt, garlic, curry, and other spices, and though they didn't seem all that Thai to me, they were delicious. I couldn't help but think how tasty these would be with some chicken & veggies for a quick dinner, so I thought I'd give it a whirl. Don't worry about not being able to find these Thai-spiced cashews where you live - this is something that can be easily recreated at home, and you can make a lot more of them for the same price that the little box cost me at the the Co-op that one day (it was a completely impulsive splurge; the do-it-yourself method was far more cost effective and rather fun to make). In fact, you can make a ton of different spiced nuts as long as you have a well-stocked spice pantry. Experimenting with these and coming up with some favorite variations is a great way to add some healthy texture and flavor to anything from salads to rice dishes to desserts. 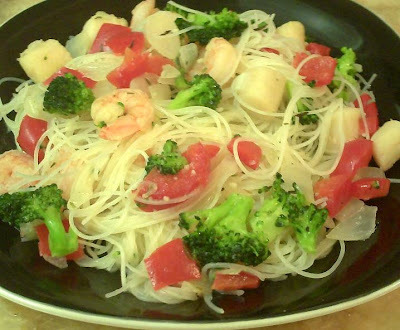 You can also use plain cashews in this if you're not feeling too adventurous or are pressed for time. Some things to note: This is one of those recipes that is heavy on the flavor and aroma. There’s quite a bit of curry and other aromatic spices, so if you like things on the bland side, this probably isn't the recipe for you, but if you're like me and like a lot of flavor on your tongue this will do the trick without being overwhelming. If you can't find or afford whole cumin seed (my latest recommendation for affodable spices - your local dollar store. More on that in a future post), don't worry. You can use ground cumin; just season your chicken well with it. There is something about whole toasted seeds that just brings a different flair to the dish, but this is still very tasty with the ground version. For the yogurt-based sauce, use regular plain yogurt and avoid the thicker Greek styles. Though the latter is my favorite, this is supposed to be a light sauce, so you want a lighter base that you can't get with the thicker, pre-strained Greek yogurts. Finally, don't feel obligated to serve this on top of a grain like rice or cous cous. If you're watching your carb intake, this will also go beautifully atop a bed of fresh, crisp spinach. Now, on with the show! 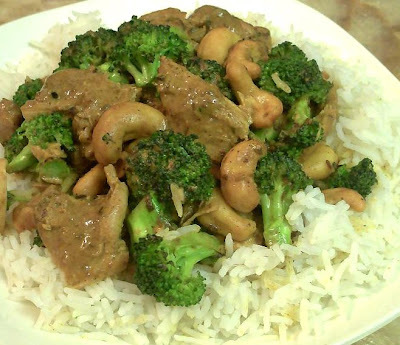 Make Curried Cashews by combining all spices in a small bowl and mixing together thoroughly. Next, place cashews in a medium bowl and add the oil, mixing until cashews are completely coated. Add the spice mixture and toss well, again until all the cashews are uniformly coated. Place on a foil covered cookie sheet in a single layer and toast for about 10-15 minutes (or until golden brown) at about 325°. Set aside when done. Combine the yogurt, honey, and other spices in a bowl and whisk together until smooth. Cut the chicken into 2” cubes and season with salt & curry powder. Heat the cooking oil in a large skillet and add the cumin seed and garlic. Toast over medium heat until fragrant and garlic begins to brown. Add the chicken and cook covered over medium low heat for about 7 minutes (or until chicken is no longer pink on the inside). While the chicken is cooking, heat another glug of oil in a smaller skillet. Over medium heat, quickly stir fry the broccoli and ¼ c cashews until the broccoli turns a crisp, bright green. Add to the chicken & its juices, stir well, then slowly pour in the yogurt sauce. Simmer for about 3-4 minutes, stirring occasionally to ensure that the sauce remains smooth. Serve over white rice or cous cous, sprinkle with extra cashews if desired, and enjoy! ~ There have been a couple changes to my site, the biggest one being the domain name! Poor Girl Eats Well is now officially http://www.poorgirleatswell.com/. If you haven’t changed your bookmarks yet, no worries; http://poorgirleatswell.blosgspot.com will redirect you to the new site. Just update them when you can! 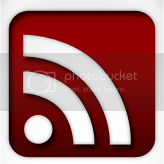 ~ I know many of you follow PGEW.com through Blogger, but there are many out there who are not part of this community. I’ve now made it possible for all loyal readers to subscribe to PGEW.com via email so you never miss a recipe or tip! Simply enter your email address in the small form to the left, make sure to answer the confirmation email, and you’ll start getting your PGEW emails with the next new post. NOTE: Please let me know if the feed doesn't work this way! Some folks were having issues with it and I want to make sure it works for everyone. Thanks! ~ My obsession with cheese may finally be giving way to my obsession with Greek food (don’t hold your breath though… I just spotted some great deals on Gruyere at TJ’s the other day, so that’ll be making an appearance this month). I love to eat it and now I’m trying to learn to make some of my favorite dishes. I’ve almost got the spanakopita down to a science, so be on the lookout for that in March. 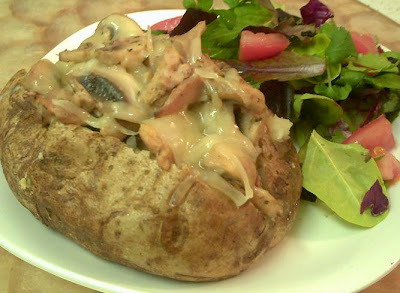 Other fun recipes will include another grown-up grilled cheese concoction, a twist on tuna salad, delicious baked potato variations, and more dessert! ~ A couple weeks ago my mom came to visit me and we hung out in the kitchen, just gossiping & cooking. She’s always been into catering and making beautiful food for parties, etc., and we worked on what I like a call the Deviled Egg Party. 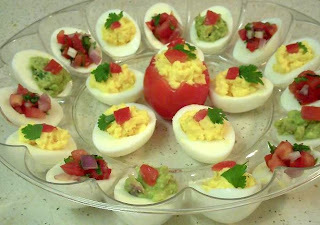 It’s a spin on the traditional deviled egg plate that can sometimes look boring and plain without the proper garnish, and offers calorie-conscious folks a couple of different options for hors d’oeuvres: there’s your traditional deviled egg (my mom’s are the BEST! ), some stuffed with guacamole, and others with pico de gallo. The combination of colors is simply lovely and it’s a really fun twist to a standard appetizer! This is great for parties, and not all that hard to make.